Dora/Ninja-Adopted! | One Dog More! This adorable little girl looks like a tiny Rottie. We really don’t know what she is mixed with but she is adorable. 10 weeks old and weighs about 4 pounds. 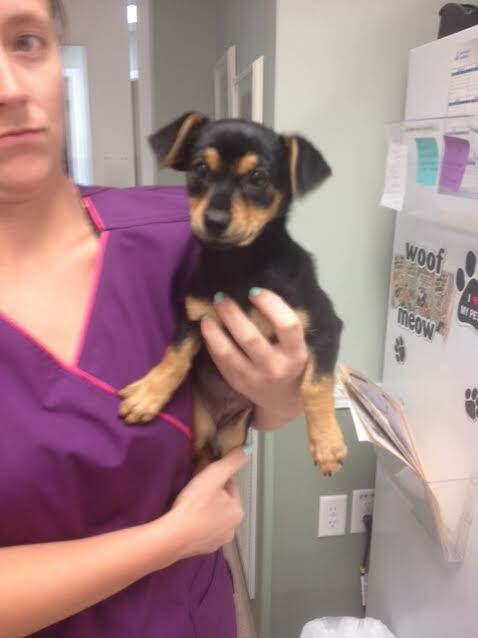 She is up to date on puppy shots, spayed, microchipped and ready to find a home. Her tail has been docked due to some idiot trying to do a home docking job on her. Animal Control saved her and our wonderful vet in NC fixed her up. I’m so glad she’s adopted.